Any day is a good day to be thankful for what we have, . My family and I are happy and healthy and grateful for all our blessings. One of whom is this beautiful little boy. This page was for Imaginisce 60 minute challenge at the beginning of the week, my trick to faster scrapping is to use pre-made elements and keep things linear, it is a great way to use up strips of left over paper and does not require a lot of fiddling. Beautiful page! 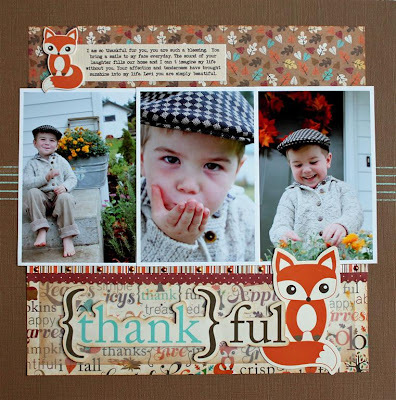 I really love how you used the little foxes :) The color choices are just wonderful!